Members of the Park Hills Fire Department take a break after fighting a two-alarm structure fire on Joplin Street in Iron Mountain Lake Friday night. No one was home at the time of the fire. Firefighters continue to knock out hot spots from a two-alarm single structure fire at Iron Mountain Lake Friday night. Several local departments were dispatched to the fire. The first dispatch came at 7:54 p.m. The structure is a total loss. 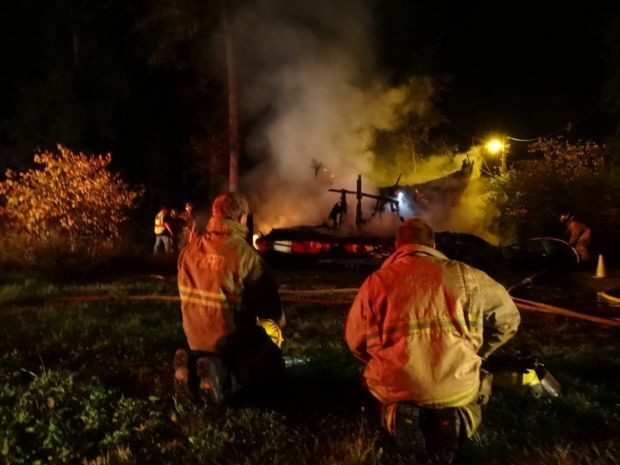 A single-family structure in Iron Mountain Lake was destroyed in a two-alarm fire Friday night. 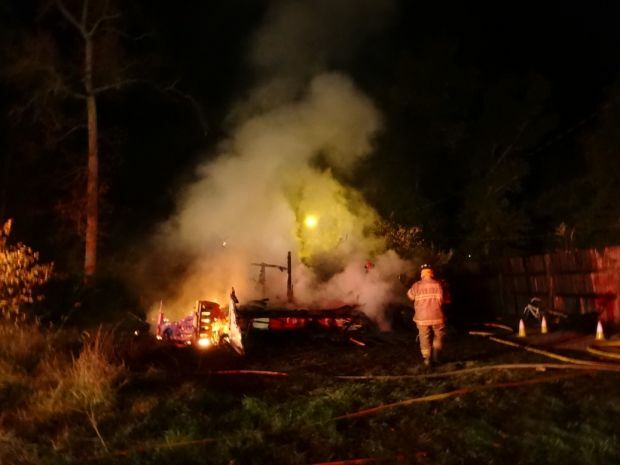 Bismarck Assistant Fire Chief Seth Radford said the first dispatch for the fire came in around 7:54 p.m. with a report of a fully-involved fire at a house on Joplin Drive. Additional units were called in due to surrounding wooden fences and nearby residences. A home directly behind the structure was evacuated. According to Iron Mountain Police, work was being done on the home and the family did not currently live in the home. It was not immediately known if electricity was hooked up. An investigator with the state fire marshal’s office was on the way to try to determine the cause of the fire. The house had burned to the ground. Departments from several agencies assisted Bismarck.